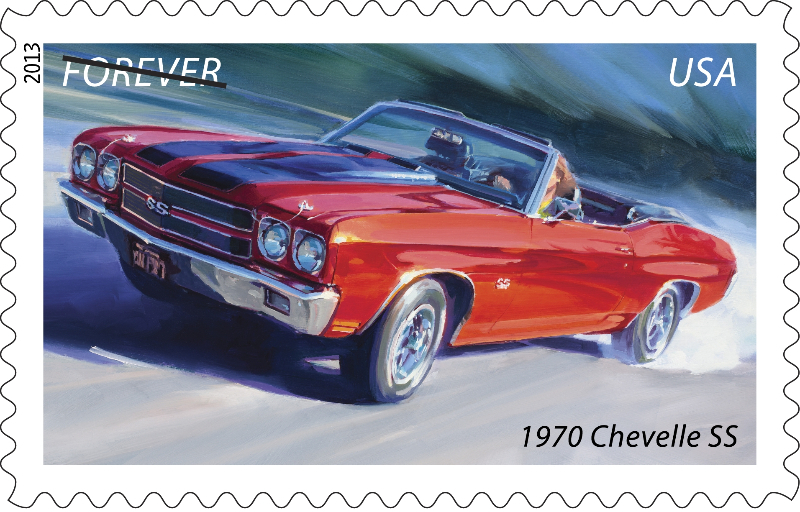 US Postal Service has a slick set of stamps available for all you diehard muscle car fans.Â This is the third set of stamps that feature a set of classic cars.Â In 2005 they first had five â€œsporty carsâ€ including the 53 Corvette, a 54 Kaiser Darin with its sliding door, a 52 Nash Healey convertible, a Studebaker Starliner from 1953 and a black 55 Ford T-Bird. In 2008 they added again five â€fin and chromeâ€ cars from the 50â€™s; 1 57 Chrysler 300C, a 57 Lincoln Premiere, a 57 Pontiac Safari (often mistaken for the Chevy Nomad), a 1957 Studebaker Golden Hawk and a 59 Cadillac Eldorado convertible. 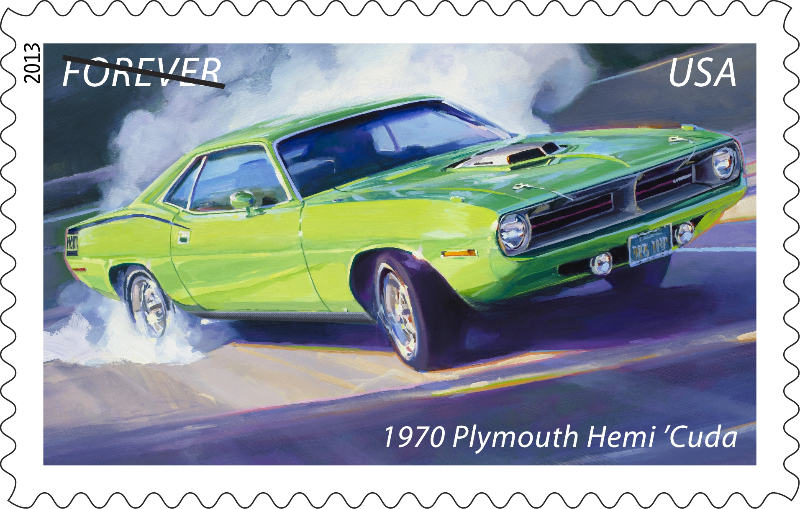 Now they released a set of â€œMuscleâ€ cars as â€œforeverâ€ stamps.Â The five are a 1966 Pontiac GTO, the 1967 Shelby GT-500, an orange 1969 Dodge Charger Daytona, the 1970 Plymouth Hemi â€™Cuda sporting Lime Light colors and a red 1970 Chevelle SS convertible. 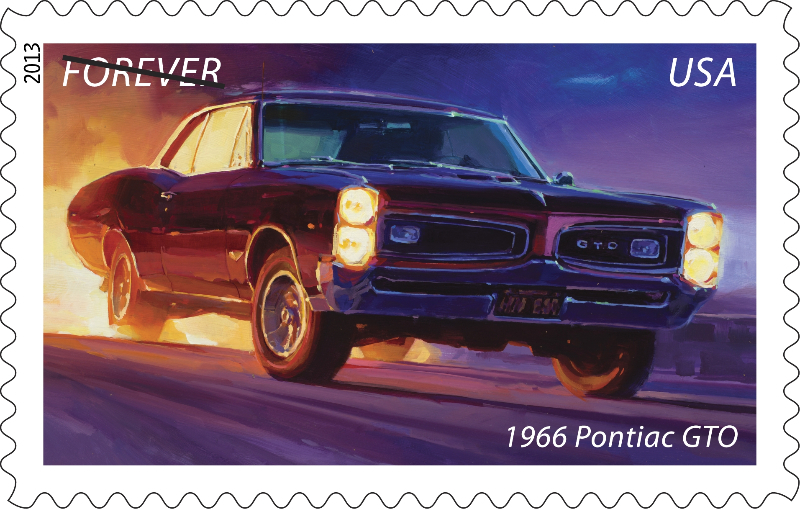 The kick off for the release of the stamps was held in Daytona Beach, Florida and included NASCARâ€™s Richard Petty and his son Kyle.Â The art work was done for this series by Tom Fritz and looks great.Â Tomâ€™s portfolio shows that he nails the look of these cars. 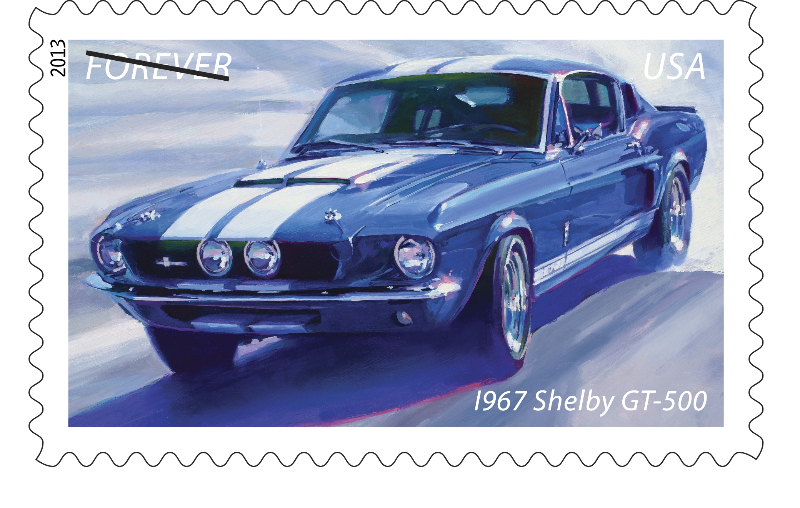 The 67 Shelby GT-500 drawn with the white LeMans strip was a sharp, if rare, look. 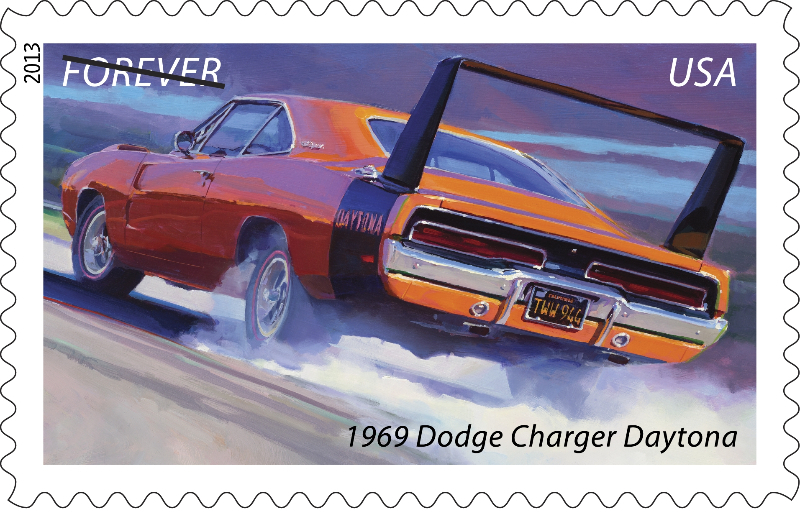 Rare also characterizes the winged Daytona Charger as only 503 were sold, to appease NASCAR rules.Â These winged monsters dominated the left turn circuit until outlawed by the bosses at NASCAR.Â There are now more clones of the winged cars in existence than ever made by Dodge. What a speedy way to grace your envelopes when you send out a letter!Â People do send out letters, right?